Sometimes I need to see a complex idea before I can fully understand it. Believe it or not, word count always seemed daunting to me, and I’m smart. What I mean is, I could never figure it out how long it should or could take to write something the size of a novel’s 80,000 to 140,000 word count. 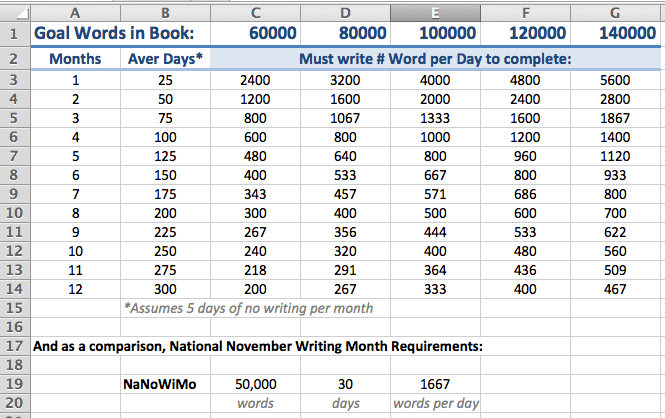 So I set myself the task of creating a simple calculator to figure it out—and this helped me better understand what my writing goals can and should be based on realistic life expectations. Just for fun, I added the NaNoWiMo calculation as well.